The World Bank’s new President Jim Yong Kim caught the attention of many as the first head of this development institution to speak at the opening of a global conference on HIV/AIDS, where he called for applying the moral energy and practical lessons of the global AIDS movement to the global fight against poverty. Yesterday he returned to the 19th International AIDS Conference now underway in Washington D.C.’s massive Convention Center to join Bill Gates, US Global AIDS Coordinator Eric Goosby, and former Lesotho health minister Mphu Ramatlapeng on a panel that discussed how developing countries can achieve greater effectiveness and efficiency in the fight against HIV/AIDS. Globally, there has been a lot more money invested in this fight over the past decade than ever before. As a direct result, thousands of lives have been saved and new infections averted, including among newborns whose mothers received treatment. But in today’s challenging financing environment, an increasingly effective and efficient HIV/AIDS response is needed to help countries to sustain their gains, prevent new infections, and continue to get treatment out to people already living with the virus. President Kim said the Bank's main strengths are its broad involvement across many sectors—spanning health, education, social safety nets, and more—and its close engagement with national policymakers in developing countries, as well as with private sector investors. This breadth of operation positions the Bank to be, as the President said, “a very good partner” in improving health delivery systems that address not only diseases like HIV/AIDS, but also other urgent health needs such as good healthcare for mothers and children. In Africa, which carries the bulk of the global burden of HIV/AIDS, Rwanda is a noteworthy example of a country where there have been spillover gains  from the response to HIV/AIDS to improving public health and addressing vulnerability as the country reaped broad benefits from its HIV/AIDS investments. President Kim said that it is time to make this sort of efficiency and effectiveness the case everywhere. “At the World Bank, we are going to work on systems science with great energy,” he said emphatically. Bill Gates said the fact that 8 million people now receiving treatment is a “very positive story”. But he also stressed the need to make treatment less expensive, as well as to bring in more money to put new patients on treatment. 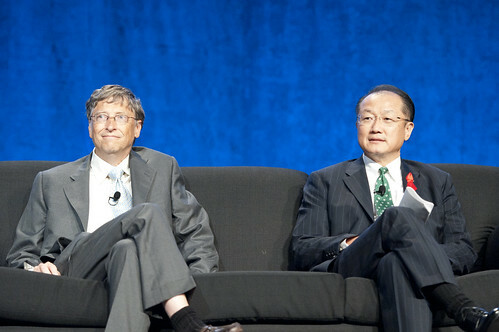 Noting that the Bill and Melinda Gates Foundation has made a further contribution to the Global Fund to Combat AIDS, TB and Malaria, bringing its total investment in the Fund to $1.4 billion, Gates also added that more tools are needed in the fight against HIV/AIDS. Even if a vaccine should be developed in the next ten years, it could still take 18 years to bring down the number of people on treatment, he said, offering a sobering perspective on the time lag in the fight against HIV/AIDS. Country ownership emerged as another important aspect of the push for greater efficiency and effectiveness in tackling HIV/AIDS. President Kim mentioned Thailand as an example of a country with a relatively low-cost HIV/AIDS program that blended in well with its other development priorities. Mphu Ramatlapeng said that countries should indeed work towards greater ownership of HIV programs but it was also important to continue seeking donor assistance, as there were a great many competing priorities for funding in countries such as hers. Ambassador Goosby spoke of the gains that would be achieved from aligning the work of PEPFAR, the Global Fund, the World Bank and others with the goals of each country. Both Ambassador Goosby and President Kim stressed the importance of accountability—to citizens in developing countries as well as to taxpayers in donor countries. What would success look like in five years, asked moderator Michael Gerson of the Washington Post. One of the most moving answers from the panel was from Mphu Ramatlapeng, who referred to a recent New York Times column entitled “The Coffin-maker Benchmark ” by Nicholas Kristof. In this piece, Kristof writes about a coffinmaker in Lesotho who says that business is down because fewer people are dying of AIDS.